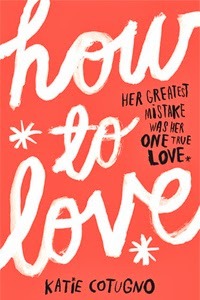 How to Love tells the story of Reena and Sawyer. At 18 years of age Reena is already a mother of a beautiful two-year-old daughter, but the father (Sawyer) is not in the picture. Why this is isn't clear at the start of this love story, but with the help of flashback chapters the reader slowly uncovers the past of these two characters. Two years after the birth of his daughter Sawyer returns and stirs up a lot of forgotten emotions in the both of them. Are they willing and able to overcome what broke them apart in the first place, or can their daughter bring them back together? This is going to be a short review as this is one of those novels that while I didn't think it was bad, I also didn't fall in love with it (no pun intended!) and as such I don't have much to say about the story as whole. I think the main reason I feel blasé about it is that I felt disconnected from the main characters and the ending felt predictable with an unsatisfying conclusion. On top of that I felt that the big issues of teenage pregnancy and teenage parenthood were handled too simple. Other than resistance from people in Reena's life, there seemed little in the way of setbacks and troubles, making it sound much more easy than it actually is. Still, the story was intriguing enough for me to finish the novel at rapid speed. I was particularly interested in the storyline taking place in the past and finding out what had happened to these two characters to first bring them together so strongly only to be pulled apart and not speak for the crucial years of their child's life. There are also some surprising revelations along the way which show that author Katie Cotugno despite not going into too much detail also doesn't shy away from tackling difficult issues which, if anything, is very admirable.